From our house, you can make numerous discoveries, visit places of interest and experience a lot in common with the family. Whether on foot, by car, by boat, everything is possible! Internal +/- one hour drive from the North Frisian county and harbor city of Husum, the town of Schleswig on the Schlei and Flensburg near the German-Danish border. Here you can experience and discover a lot. Especially the Frisian cities exude a special charm. We recommend you with your tours through North Frisia sometimes to leave the main roads, because especially the small villages and towns along the coast, between Geest and march are worth seeing and can always relive fishing village romance and North Frisian life. The health resort Niebüll is located about 8 km from our holiday and is definitely worth a visit. Visit the open air museum Friesian Museum with a frieze house preserved in its original building substance. Discover the flora and fauna in the Natural History Museum, the Richard-Haizmann Museum provides information on the Modern Art. Especially popular here is also directly adjacent Schleswig-Holstein Wadden Sea National Park. Another insider tip is the Noldemuseum in Seebüll. Immerse yourself the art of Emil Nolde, inquire about its history and be impressed by his works. Prachtig huis in mooie omgeving. Honden toegestaan!! Prachtig huis, alles aanwezig. Aanrader. Veel te doen in de omgeving. Wir freuen uns, dass es Ihnen gut in Katzhörn gefallen hat. Sehr schönes Haus in toller Alleinlage und ein idealer Ausgangspunkt für viele Ausflüge. wir bedanken uns für Ihre positive Bewertung. Freundlicher und unkomplizierter Kontakt mit Vermieter. Unsere Mitarbeiter waren sehr zufrieden und würden das Ferienhaus weiterempfehlen. Sehr zu empfehlen. Kleine Mango: die Treppe zu den Schlafräumen im 1. Stock sehr schmal und steil, für Menschen, die nicht mehr so gut zu Fuss sind, schwierig. Der Rest super. So eine gute Ausstattung haben wir bisher in keinem Ferienhaus gehabt. Schöne Lage, sehr ruhig. Waren bestimmt nicht das letzte Mal hier. Das Ferienhaus ist wunderschön. Tausend kleine Details. Wir sind begeistert. 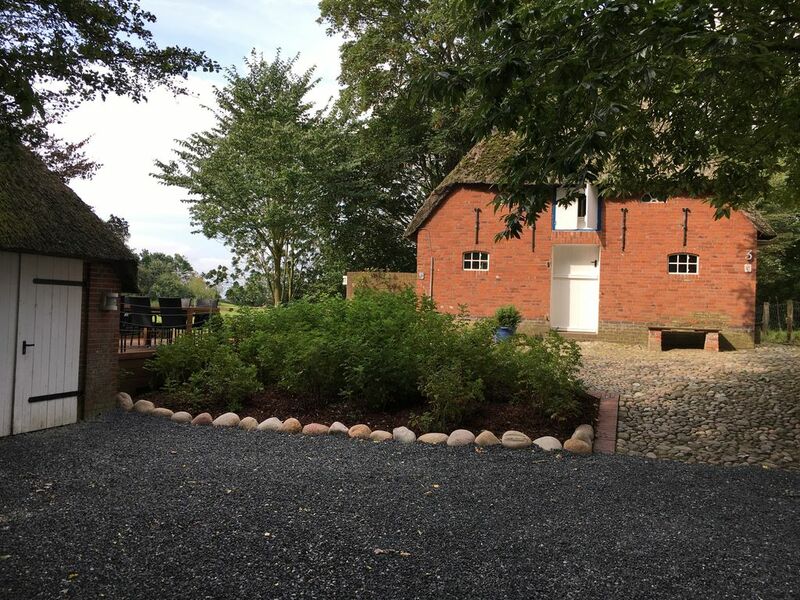 Our holiday home for up to 6 people located in the peaceful village of Emmelsbüll-Horsbüll in the district of North Friesland, right on the North Sea coast. An ideal location for a holiday in North Frisia, since we are directly between the National Park and World Heritage Wadden Sea in the west and the Schleswig-Holstein ridge of the East. Spend your family holiday in Emmelsbüll-Horsbüll and get the fashionable setting for exciting trips in the region: In just a short time you can reach Husum, Flensburg, Friedrichstadt or the Danish Tonder. Take a trip to the North Sea islands of Amrum, Föhr, the Halligen or Romo, explore the hiking and cycling trails of the Frisian march, explore the Wadden Sea or relax on one of the clean beaches of the region. Stornierung Im Falle eines Reiserücktritts behalten wir uns vor, einen Kostenausfallaufwand einzubehalten.